Huang Xiao Ming possesses a famous, distinctive cleft in his chin. Recently, tabloids published photos of Xiao Ming before his meteoric rise to fame and the before and after changes in the photos were quite apparent. Allegedly, Xiao Ming may have received plastic surgery on his chin. Some people point to the scar on his chin as proof. But Xiao Ming claimed that the scar was due to an injury when he was younger. Raymond Lam Fung is riding on a popularity peak recently. Earlier at the start of 2010, he received the Most Popular Male Singer in Asia-Pacific award. He filmed two movies, Jade Pearl and Perfect Wedding. In July, he will be holding a concert series at the Hong Kong Coliseum. With Raymond’s increasing popularity, his facial features have continued to change as well. Tabloids claim that Raymond may have received additional plastic surgery recently. Examining his close-up photos, tabloids pointed out that his double eyelid creases appear to have deepened and his nose appeared more distinct. The most striking change was that his lower chin seems fuller and has a slight rounded protrusion with a cleft, which was not observed in 2009 and older photos. Jayne: It’s a growing trend for male celebrities to get plastic surgery too. Ah, I originally thought Huang Xiao Ming was a natural born beauty…. Well, a little cosmetic enhancement is widely accepted anyway. Somehow, I do not believe this article. Raymond had a really packed schedule for the last 3-4 years filming and concert, travelling and all that. Unless they show evidence of him coming in and out or staying in a hospital, it’s hard to believe someone as high profile as him can get a plastic surgery done unnoticed. Chilam has a minor nose surgery and had to stay 2 days in the hospital and it’s all over the papers. The second photo looks like a chin job done by Dr.Photoshop. Anyway today, there are plenty of creams, jabs, others methods of enhancing and contouring. Changes as someone ages is inevitable, some more prominent than others. Common with celebs, part of their asset. Raymond needs not take the risks when he has so many jobs lined up (imagine a failed surgery in between job), popularity plus compliments about his good looks are already there. However, even if it is true, it’s his personal choice. As an audience, he enjoys performing, we enjoy watching. In China they have lunch time rhinoplasty I think that’s what it is call. Can be done without staying over. However packed he could give 2 days of his time. I believe the pictures and I like Ray’s approach to plastic surgery; enhancing rather than the Koreans and Japanese who are into total change. But then Ray was a good looking guy already. I just hope he doesn’t get obsessed with it. As for Huang Xiao Ming, shocking to know his chin ain’t original and his original looks he look like an angry man. Anyway still an upgrade. Which means are there no naturally good looking men in China? I think its up for us to decide whether to believe or not or just treat it as a grain of salt 😛 This is the same case with Stephen Huynh case hehe. How would you translate the phrase “無火煮食” ? I’m trying to explain a Next magazine interview title to a friend but my Chinese isn’t that brilliant haha. I am really not buying this article. If you notice, in the comparisons, one picture is frontal while the other is in profile. Clearly the one in profile is going to show more distinct facial features. Time is also a factor people should consider; as time goes on, they lose their baby fat, become buff…more chiseled (^_^) but in any case, it’s their personal choice if they want to do it. 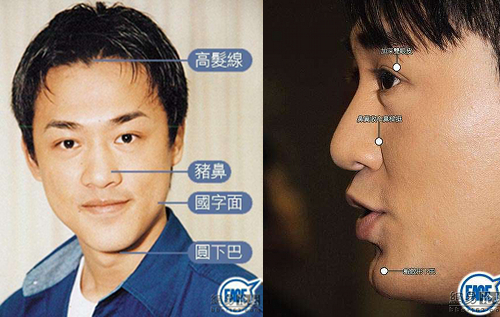 Huang Xiao Ming’s before and after phone both featured a cleft chin. I don’t see any enhancement on the part of the chin. About him looking angry in his original look, of course he looks angry. He was frowning. The ‘after’ photo, he was smiling. As for Raymond. I hope he stop at now. Don’t do anymore surgery. He’s handsome enough. I saw him real life a few years ago. He’s already very handsome at that time and more handsome than Ron. No need to upgrade anymore, Raymond. Doing too much will just makes one look fake. Yes Raymond is already good looking enough and has prince charming image now. IF he’s into this plastic surgery thing I hope he stops too. Sob :(. Don’t get the answer to my earlier translation question. Its ok I’ll try to find elsewhere. Funn, lunch time rhinoplasty? Do the plastic surgeons inject the gel into the nose to contour it? In the original Face Magazine article, the reporter interviewed an expert in the field (don’t remember if he’s a surgeon himself) and it’s also common to inject gel into the chin area to contour it. Supposedly these chin injections only last 1 year, so follow-up shots are required to maintain the look. Women do saline injections to enhance their breasts. They are cheaper than implants. The injections are not permanent, so you are not stuck with a bad plastic job, which may be a good thing. As for Huang Xiao Ming, I personally think that he had some minor upgrades. The cleft seems more pronounced now. Plus I think he had some deepening of eyelid crease or other touch up job to make his eyes more intense. And is it possible that he had his cheekbones lifted or contoured to give more dimension to his face? His old photo seemed to have a bigger broader chin and flatter cheeks. If he did get the cheekbones done, then it balances his square jaw more. Huang Xiao Ming’s definitely looks like a Greek God now! From the cleft to the cheekbones, to defined nose bridge etc, he has very Western features. Too much plastic surgery would also be bad for your health in the long run. One of my mom’s friends had a failed nose job and is now sick and looks even worse than she did before the surgery… Good example of having overdone plastic surgery is Micheal Jackson…. But I don’t think any of them will ever have as much as he did. Jayne, I saw a documentary on plastic surgery in china. I am not sure if it was the gel-contour method, but seriously they do have this so called lunch time procedure where you go and get it done and leave all within an hour or so. The enhancement probably isn’t much, just a little difference because I can’t imagine the surgeons breaking through the bones and all in such a short time. SO maybe it is the gel-contour method, not that I am an expert in such procedures. Yes I agree with you that Huang Xiaoming probably enhanced the dimple on his chin. His chin is already quite prominent so the cleft enhanced does enhance his looks. As for eyes, very common procedure for asians. Except did he enlarge it a little? Or double eyelids itself will make someone look more awake? Cheekbones lifted? I don’t think so. Maybe he just lost a lot of weight or maybe instead of cheekbone he lifted his jawbone? Less squarish face? Very tiny enhancement. This is the sort that should be the standard of good plastic surgery. Just enough, don’t overdo it like some western counterpart. But he doesn’t look like greek god, he looks like Ma Jingtao, but better looking. You can say he looks like those minority group in China? Pretty girls, handsome men? A pity he seems rather skinny in pictures. As for Raymond lam, may I suggest all he needs is a good haircut? 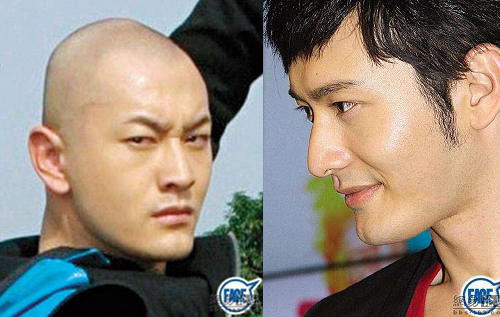 I am pretty sure that Raymond Lam has done plastic surgery. I have recently started rewatching his old TVB series “Step into the Past” and he looked totally different. I think all it is is that he is getting older and has lost some of his baby fat in his face, I don’t think he got sugury cause his face is like the same shape just it’s smaller and it’s actully possible for a person to go from no double eyelids to double eyelids. My aunt was born with no double eyelid thing and now she has them becAuse of make up and this tape thing that like stretches it out to form double eyelids or something. And why would some one go through plastic surgery if they are in the spot light, it would just mAke everyone notice it even more. Also in the first picture of raymond does it look like to you that nose was photoshopes in to make it look ugly cause he nose never looked like that. As for the whole double eye thing and chin plastic surgery I doubt any of them did that. I don’t even get why someone would want plastic surgery…that god I’m no with double eyelids no need for complaining or plastic surgery…..
whatever ray did or not did, i still love him for who he is. but if ray its true did chin job, it doesnt change my opinion of him, he still an amazingly talented music, act, spokperson. I’ve seen old photos of Huang Xiao Ming…he was a natural-born beauty to begin with. To be honest, even without the chin surgery, he was already very good-looking. As for rumors about his other “enhanced” features…you really can’t say that just because he seems to look different on magazines and newspapers etc. His photos could have easily been “enhanced” via PHOTOSHOP…deepening dimples, changing face shape etc. I’ve worked with photographers (not just professional photographers, but also tabloid photographers). They always edit their images before publishing. I agree since I have liked and noticed Huang Xiao Ming ever since he first started out and he looks pretty much the same. I first saw him in Long Zhu Feng Bao which was made around 1999/2000 period and he looks pretty much the same. I think that was when he just entered the circle because he only played a supporting character/role in that series.